Independence Hall – While historical attractions abound in Philly, Independence Hall has particular significance to the development of the United States. In this building in 1776, the Founding Fathers came together to sign the Declaration of Independence. Eleven years later, representatives from a dozen states met here to lay the framework for the U.S. Constitution. Today, the UNESCO World Heritage Site is the centerpiece of Independence National Historical Park, and guided tours are available to visitors year-round. Free, timed tickets are required and can be picked up at the Independence Visitor Center at 6th and Market Streets. Tours usually fill up before noon, so visitors are encouraged to plan accordingly. Visitors must enter a security checkpoint at 5th and Chestnut streets prior to tour. Liberty Bell – Moved to its current location across from Independence Hall in 2003, the Bell was cast in 1753 in Philadelphia to adorn the State House. Originally used to call the Pennsylvania Assembly to meetings, it was later adopted by abolitionists, suffragists and Civil Rights advocates, and many use it as their symbol today. After almost a century of constant use, the Bell cracked while tolling for George Washington’s birthday in 1846. Visitors can tour the Liberty Bell Center year-round. Valley Forge – In the winter of 1777-1778, Valley Forge was the encampment headquarters of the Continental Army during the Revolutionary War. Today, a national park on this site honours the sacrifice and strength of those who helped secure freedom for the United States. Valley Forge National Historical Park offers a variety of programming throughout the year, including ranger programs, guided tours and living history demonstrations. Philadelphia Museum of Art and the “Rocky Steps” – The Philadelphia Museum of Art was forever immortalized in the classic Rocky film franchise. While the “Rocky Steps” draw a slew of visitors who want to reenact Stallone’s on-screen training regimen, the museum is even more impressive inside. The astounding art collection spans more than 2,000 years and includes sculpture, paintings, textiles, arms and armour, photography, prints and drawings. Barnes Foundation – While its Philadelphia home opened in May 2012, the Barnes Foundation dates back to 1922 when Dr. Albert C. Barnes established it to promote the advancement of education and the appreciation of the fine arts and horticulture. The Barnes boasts one of the world’s most important collections of Impressionist, Post-Impressionist and early Modern paintings, as well as Old Master works, Native American jewelry, antiquities and African sculpture. Mural Arts Philadelphia – In Philadelphia, every wall is a potential blank canvas, and stunning murals adorn building exteriors all over the city. Begun in 1984 as an anti-graffiti initiative, the renowned Mural Arts Philadelphia uses art to ignite change in communities, transforming public spaces and individual lives. To date, the program has produced nearly 4,000 murals. Interested visitors can view many of these works on a variety of walking, trolley, subway and Segway tours. Private and themed tours are available for groups, as well as interactive painting experiences. Most tours leave from the Pennsylvania Academy of the Fine Arts’ Hamilton Building. The Philadelphia Orchestra – As one of the preeminent orchestras in the world, The Philadelphia Orchestra maintains a rich tradition of the highest level of artistic quality. Today, Music Director Yannick Nézet-Séguin leads the group, whose main season runs from September through May. The Orchestra performs in venues around the world, but its main home is Verizon Hall at the Kimmel Center for the Performing Arts. Curtis Institute of Music – Founded in 1924, the Curtis Institute of Music educates and trains gifted performers to attain careers in the arts. Musicians of all ages and backgrounds travel from around the world to attend this prestigious school. Students perform solo and chamber works most Monday, Wednesday and Friday evenings during the school year as part of the free recital series. Boathouse Row – This National Historic Landmark consists of 10 charming boathouses that sit on the banks of the Schuylkill River. These structures have been associated with rowing since the 19th century, and the boat clubs that occupy them serve as members of the Schuylkill Navy of Philadelphia and have produced many Olympic champions. 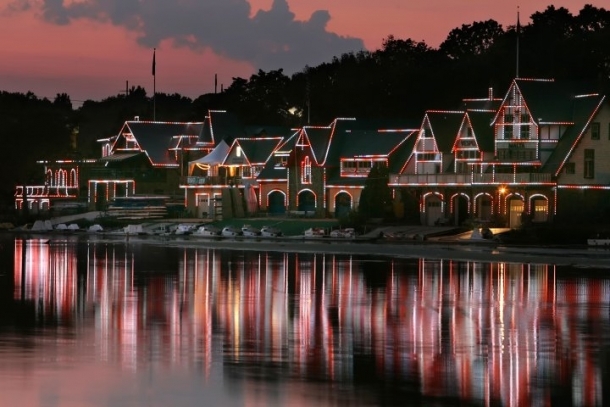 At night, the glittering lights that frame the buildings on Boathouse Row make for idyllic scenery as they reflect off of the river’s surface. City Hall – Located at the intersection of Market and Broad Streets, City Hall has been Philadelphia’s government headquarters for more than 100 years. Covering more than 14.5 acres, it’s the largest municipal building in the United States—and one of the most elaborate. For a bird’s-eye view of the city, visitors head to the observation deck, which sits just below the 37’ bronze statue of William Penn that tops the clock tower. The building is open to the public from Monday to Friday, and visitors can take either a four-person tower tour that leaves every 15 minutes between 9:30 a.m. and 4:15 p.m. or a 12:30 p.m. two-hour public tour that highlights the art, architecture, the tower and history of the building. Tickets are sold on a first-come, first- served basis. Reservations can be made on the day of the tour. Fairmount Park – Philadelphia’s Fairmount Park, a 2,050-acre gem scattered throughout the city, offers more than 50 miles of designated trails, 43 sculptures, two performing arts centers, the Philadelphia Zoo, Shofuso Japanese House and Gardens, historic mansions, the Smith Memorial Playground and Playhouse and renowned museums. Longwood Gardens – This mega garden attracts visitors from around the globe to its 1,077 acres filled with 20 outdoor gardens, 20 indoor gardens, 11,000 different types of plants, spectacular fountains and picturesque meadows and woodlands. The horticultural haven also hosts 400 events each year, including flower shows, gardening demonstrations, educational programs, children’s activities, concerts and musical theater. Philly Cheesesteaks – The Philly cheesesteak is inarguably the city’s most famous food. These savoury sandwiches consist of chopped (or thinly sliced) steak and a choice of cheeses and/or fried onions on a hoagie roll. Those in the know know to order their cheesesteak with two words only: cheese selection (provolone, American or Whiz) and “wit” or “without” onions. The debate about which local spot cooks up the best sandwich may never end, but for an iconic Philly experience, locals visit the corner of South 9th Street and Passyunk Avenue, where rivals Geno’s Steaks and Pat’s King of Steaks feed the masses. Soft Pretzels – Always delicious, the Philly soft pretzel is a staple of any local’s diet. These chewy, salty treats buck the traditional pretzel shape and instead take the form of a figure eight. Often enjoyed with yellow mustard, Philly soft pretzels are perfect for breakfast, lunch, dinner or anytime in between and are commonly purchased from street vendors. BYOBs – Short for “bring your own bottle,” BYOB restaurants pack the city’s culinary landscape. Customers are invited to provide their own alcohol to accompany their meals at these eateries, which range from high-end establishments to local neighbourhood haunts. Reading Terminal Market – This indoor foodie paradise is a one-stop shop for everything from local produce and meats to artisanal cheeses and desserts. The public space also provides open seating where customers can enjoy meals from more than 30 restaurants. While the market is open seven days a week, the Amish vendors, a huge draw for visitors and locals, typically sell their goods on a more limited schedule, Monday or Tuesday through Saturday. South 9th Street Italian Market – Dating back to the 1880s, the South 9th Street Italian Market is the nation’s oldest, continuous outdoor market. The iconic curb stands line South 9th Street, showcasing fresh fruit and vegetables. In the shops, restaurants and taverns, visitors can find fourth and fifth generation merchants. While Italian immigrants originally dominated this shopping district, many of today’s business owners hail from all parts of the world. Mummers Parade – A beloved Philadelphia New Year’s Day tradition, the Mummers Parade is best described as the city’s version of Mardi Gras. The oldest folk parade in the United States, some say that the festivities can be traced back to 400 B.C. The first city-sanctioned Mummers Parade took place on January 1, 1901. Clubs throughout the city work on their costumes and routines all year long and compete for prizes in categories, including the String Band Division, Fancy Brigades, Fancy Division, Comics and Wenches. PHS Philadelphia Flower Show – Every March, the PHS Philadelphia Flower Show transforms the Pennsylvania Convention Center into an awe-inspiring landscape of plants and floral design. The largest flower show in the United States, the PHS production dates back more than 187 years. Over the course of nine days, gardening enthusiasts enjoy flower-arranging competitions, demonstrations, special events and a massive indoor marketplace. The 2018 PHS Philadelphia Flower Show, “Wonders of Water,” will run March 3 to March 11 at the Pennsylvania Convention Center. Philly Sports – The Philly Phanatic is far from the only diehard sports fan in this city. Whether they’re rooting for the Phillies (baseball), Eagles (football), Flyers (hockey), 76ers (basketball) or the Union (soccer), residents here take immense pride in their local teams. Most home games are played just a few miles from Center City in a sports complex that includes the Wells Fargo Center, Lincoln Financial Field and Citizens Bank Park. The Philadelphia Union play home matches at PPL Park in nearby Chester County. When a local team wins a championship, a massive parade takes place on Broad Street in Center City Philadelphia.